Review – Shelter for Blythe by Susan Stoker – 5 Heartfelt, Heart-Warming Stars!!! When Blythe finds herself in the ER, Sawyer swears to help her, and he won’t take no for an answer. Just when Blythe thought her past was long behind her, it reappears with a vengeance. I’d been looking forward to Blythe and Sawyer’s story. Both their characters had intrigued me in the other books in the Badge of Honor’s series, and Susan Stoker did not disappoint. I love that both these characters were drawn together in the unlikely of circumstances, and the way in which they connected with each other. Considering the hell Blythe had been through, she always put the well being of others before her own and she was always willing to help others. She never shied away from helping, even when it meant putting her needs and safety before others. Sawyer wasn’t your typical Susan Stoker hero, he was different in all the right ways. He was perfect in my eyes. He had all the qualities of a great man, and I cared not for how he was built, if anything the difference in his build to his fellow colleagues and friends, is what drew me to him that little more. 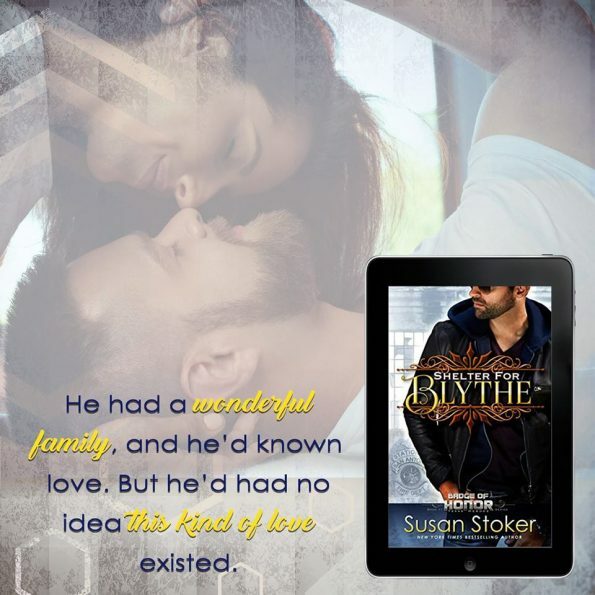 Shelter for Blythe isn’t so much an action romance as many of Susan Stokers stories are, however, it is a romance story that tugs at the heart. Giving us the reader a different aspect of life. Not everyone living homeless got there because their actions were untoward, some had the worst luck and found that those they believed to be friends, weren’t there when they needed them most. Although this story can be read as a standalone, to get the full enjoyment of this story, I recommend reading the Badge of Honor series in order, starting with Justice for Mackenzie.